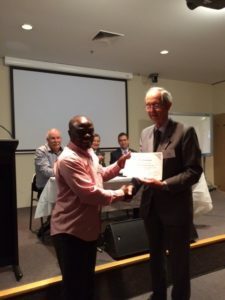 Supported by the Crawford Fund, visiting scientist and PhD candidate Kenneth Mbene, is studying at the University of South Australia’s Centre for Environmental Risk Assessment and Remediation (CERAR). He is investigating the key agricultural nutrient – phosphorus. Understanding more about phosphorus is critical because it is essential for plant growth and has no alternative source. Sourced from phosphate rock, the nutrient is currently added to soil in the form of fertiliser, which all modern agriculture systems depend on. Time is running out according to CERAR’s Chair in Environmental Science, Professor Nanthi Bolan, who says the world could see a food security crisis in the near future due to the decline in phosphorus availability. “The good news is that phosphorus can be captured and recycled and this is the area we are focussing on. One option, for example, is through animal manure management. Poultry manure is rich in plant nutrients including phosphorus,” Prof Bolan says.